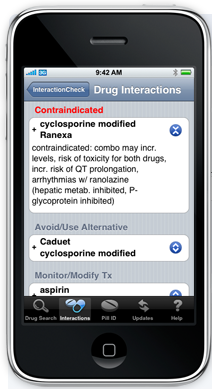 ePocrates can be downloaded for free to your iPhone, bringing one of the most popular PDA based medical references to the iPhone. The larger screen, compared to most PDAs, makes reading the information more comfortable. ePocrates for the iPhone also introduces the first mobile pill identifier on the market. ePocrates can be downloaded via the AppStore in iTunes. ePocrates for the iPhone lacks MobileCME and MedTools, which are components of ePocrates Rx Free for PalmOS and WindowsMobile.